dCS Debussy review | What Hi-Fi? Entry-level – we doubt whether we’ve ever described an eight thousand pound product like that, but in dCS’s rarefied world that’s exactly the role served by the what the dCS Debussy digital-to-analogue converter. The company’s range focuses on digital products and starts with this stand-alone converter going all the way up to a mighty four-box CD player called Scarlatti, which will set you back the price of a well-specified Porsche Boxster. Entry-level status or not, the Debussy’s price demands it be immaculately built. And unsurprisingly, given the company’s enviable track record in the area of construction, it is. Its casework – it has a solid aluminium fascia and high-grade aluminium casework – feels immensely robust, and every surface is finished beautifully. The company’s attention to detail is clear, from the hidden bolts to the nicely weighted all-metal buttons. Even the remote control is luxuriously chunky and nice to use, yet without feeling overdone. This DAC is a slim unit, but surprisingly deep in proportion. It tips the scales at just under 9kg – quite hefty for this type of product – and its idiosyncratic nature doesn’t stop there: open the case and you’ll find dCS does things its own way. It refuses to buy the off-the-shelf conversion solutions most rivals employ. Instead it has developed its own circuitry, and refined it over the years. 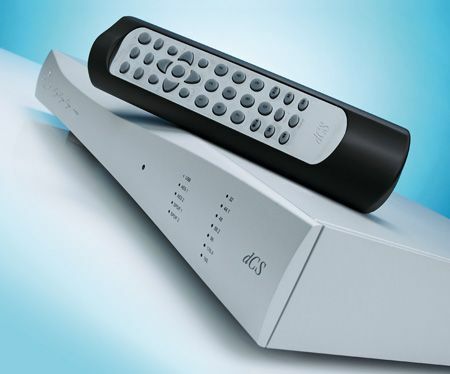 All of dCS’s DAC designs use the same in-house electronic building blocks. The difference between the products is that the supporting electronics architecture such as the power supply and clock get more elaborate as the price rises. Much of the circuitry is software-driven, which lets dCS continue to develop the design for years to come, making upgrades available as and when they occur. Like other dCS products, the Debussy uses the company's Ring DAC, a discrete balanced designed which upsamples all incoming signals to 5 bits at either 2.822MHz or 3.07mHz, and a multimode phase-locked loop to tackle jitter. You can also upgrade the DAC with the addition of one of dCS's offboard Master Clock devices. The digital filters, meanwhile, are implemented in Digital Signal Processors, offering the choice of linear phase with pre-ringing or a non-linear setting with no pre-ringing, the company saying that 'The optimum filter is a matter of personal preference'. In addition. the company's approach allows future upgrades to be made in software, for example from a simple upgrade disc or by connection to a computer. If you’re thinking about spending this much money on a product that lack of obsolescence is important. The Debussy’s range of inputs is slightly limited, though not disastrously so. The obvious omission is the lack of an optical input. Other than that, there’s the usual complement of coaxial, (24-bit/96kHz-compatible in both RCA and BNC forms), a couple of AES/EBUs and an asynchronous 24-bit/192kHz capable USB input. The only other way to get 24-bit/192kHz signals in is to use both AES/EBU inputs together. We think most users will stick with USB. On the output front, the Debussy offers a choice of balanced or conventional outputs, while a built-in digital volume control can also be selected to allow the DAC to be run straight into a power amplifier, thus acting as a digital preamp. Either way, the sonic differences are small enough to come down to personal taste. In use, the first thing that grabs our attention is the converter’s tonal neutrality. Not a particularly glamorous talent, we admit – but it’s vital to making voices and acoustic instruments sound right. The dCS manages that with ease; it’s the kind of sound you don’t question. Take a listen to Debussy’s Clair de Lune (it seems appropriate) and harmonically complex instruments such as pianos sound convincingly rich and full-bodied. Importantly, though, things are never overstated. Add strong but fluid dynamics, explosive bass and impressive agility into the mix and you have a product that thunders along when the music demands. Listen to Stravinsky’s The Firebird Suite and there’s plenty of passion on offer. The Debussy’s dynamic reach is massive and the sense of authority, absolute. Its sound staging is deeply impressive, too: the presentation is lovely and spacious, yet delivers a convincing sense of depth, too. Instruments are nicely layered and positioned with great precision. Then there’s that choice of filter options, too: the default linear phase one seems a little more transparent to us, though the second option sounds a touch more substantial and arguably a little more fluid. So, that’s what the DAC does with conventional 16-bit/44.1kHz music fed from a Cyrus CD XT SE2/PSX-R combination, an Apple MacBook running the Pure Music software or a Naim NDX/555PS streamer. Switch to high-res material such as Kate Bush’s 50 Words for Snow (24-bit/96kHz), The Rolling Stones’ Let it Bleed (24-bit/88kHz) and a 24-bit/192kHz recording of Rachmaninov’s Symphony Dances and things get even better. There are some people that doubt whether high-resolution recordings sound any better than CD quality, but for us there's no contest. With the higher resolution files the dCS’s sound takes a big stride forward in terms of subtlety and dynamic fluidity. The Rachmaninov symphony in particular has huge dynamic shifts, and these are delivered in stunning fashion through our reference system of Bryston amplification and ATC ACM 50 speakers. Regardless of signal quality the DAC’s character remains unchanged, though. It remains as neutral and even-handed as before, delivering the sound in all it glory (or otherwise) without colouring or affecting it in any significant way. As such, the Debussy is a hands-off product in the best way possible. Provided the rest of your system is up to the same standard, this DAC will deliver as honest a rendition as we’ve heard. Eight grand is a lot of money to spend on any piece of hi-fi – especially if it’s as seemingly innocuous as this – but in the right system, this dCS sounds all the money… and then some. Manufacturer Data Conversion Systems, Ltd.